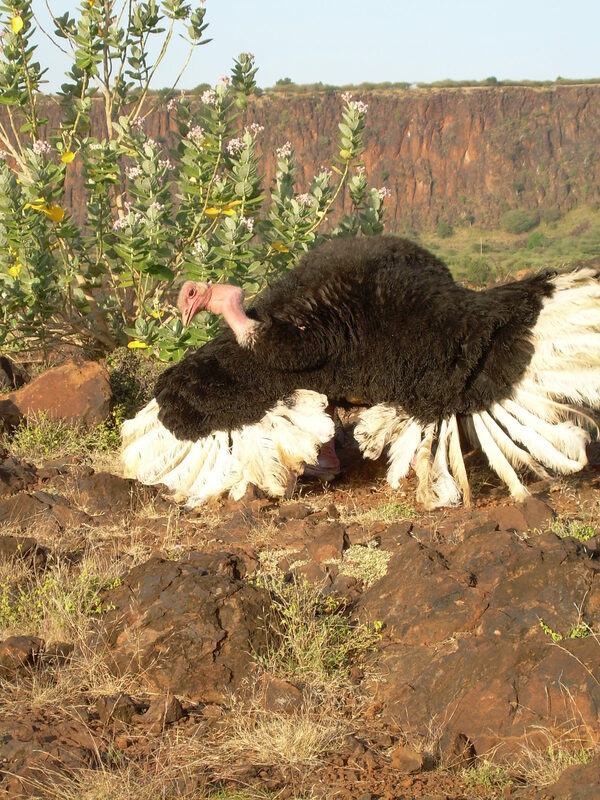 Common Ostrich is one of the two species in Kenya, the other is Somali Ostrich found in the northern eastern part of the country. Their distribution in Kenya is widespread. 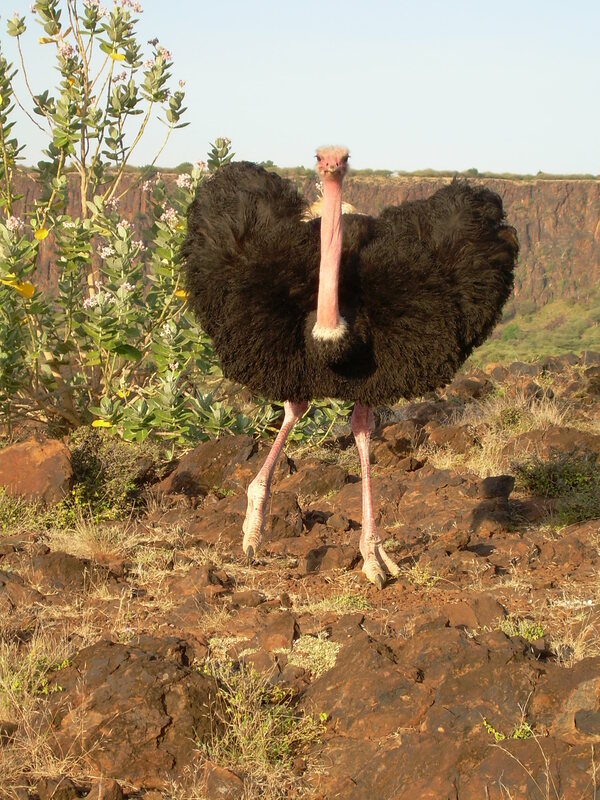 They are the tallest and heaviest birds in the world and belong to a primitive group called rarities. Because of their poorly developed sternum, they do not have the place where the muscle required to aid flight can be attached. They are adopted to terrestrial lifestyle. They can run incredibly fast. 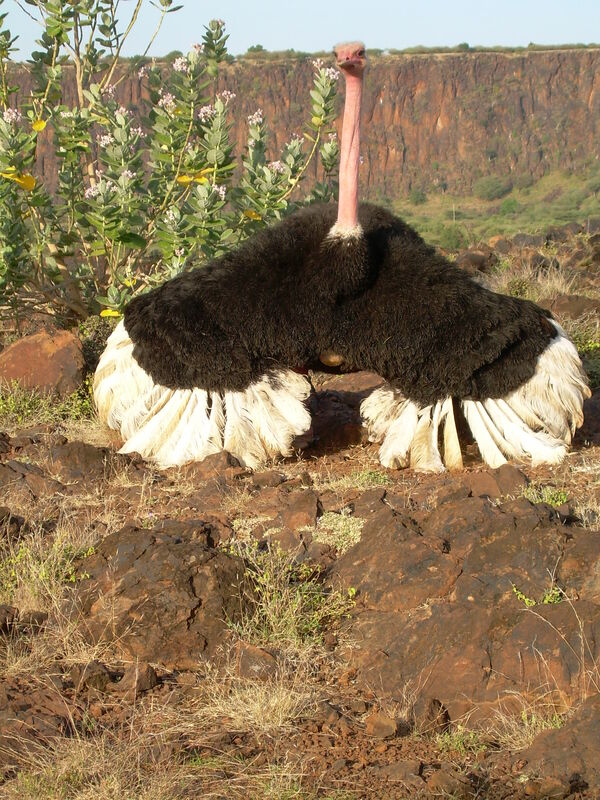 Ostriches have sexual dimorphism where the male is brownish black with white wings, tail and neck ring. The female appears in a generally grey-brown with pale feather edge with neck and legs being pale-pinkish. 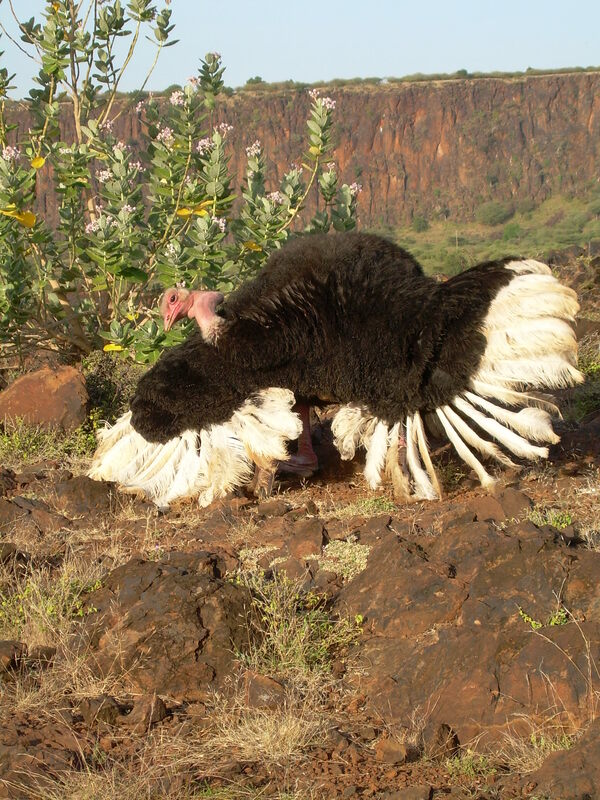 The photos taken show the male performing their normal interesting courtship display mostly referred to as kantling, whereby they squat down and then sway from side to side while fanning and quivering their outstretched wings. This is thought to induce the female into wanting to mate. I managed to capture these outside my home in Lake Baringo. This guy is a bit confused as he performed the dance for me! 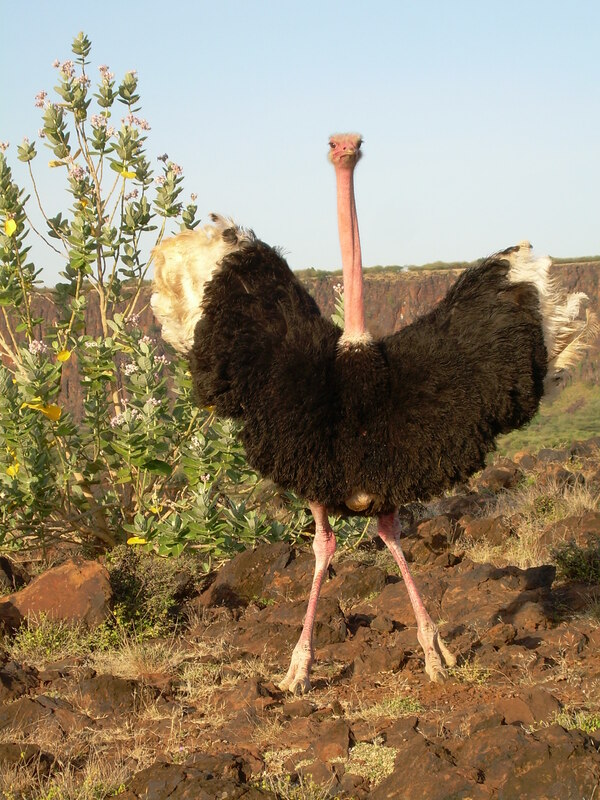 Perhaps I look like a female Ostrich. Enjoy this rare glimpse at the Common Ostrich’s courtship display. Very, very cool. Thank you for sharing these incredible pictures and the story too! These are incredible photos! 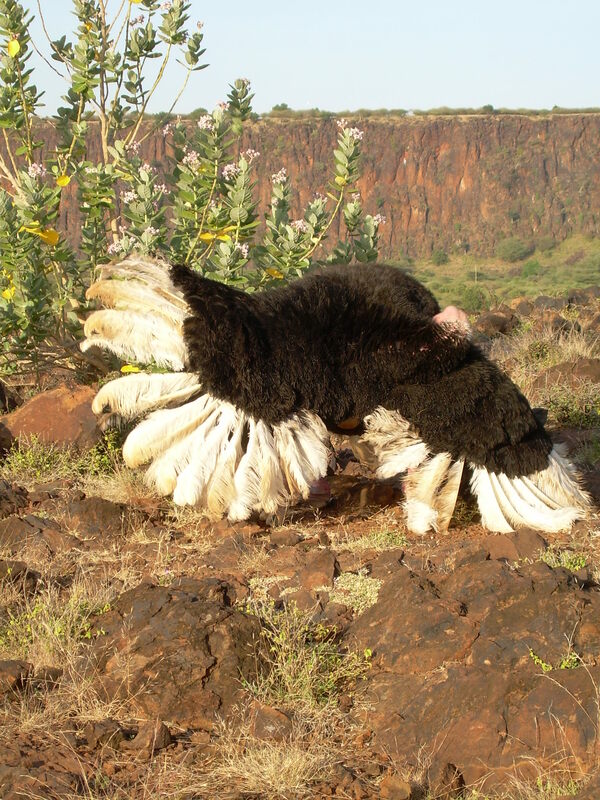 I didn’t know that ostriches dance. Thanks so much for sharing! Thanks, yes it’s pretty amazing to see them dance. I actually enjoyed the mating dance my self, I guess you would love it too. You’re welcome!! Hi Smith, You have a nice blog too!! !I like the Orange-crowned Warbler, you know how secretive warblers are and still you managed to get a good shot!kudos.I guess as a photographer you will like it at my home area of Lake Baringo.You’re most welcome. Amazing photos!!! I keep looking and relooking at them, you can feel its dance before you, seems actually so sweet and tame. Just awesome!